Beijing police have arrested a man for selling counterfeit mascots and commemorative coins of the 2008 Beijing Olympic Games. According to the legal affairs department of the Beijing Organizing Committee for the Olympic Games (BOCOG), a man surnamed Fu was found selling the fake goods at a market in the city's Haidian District. 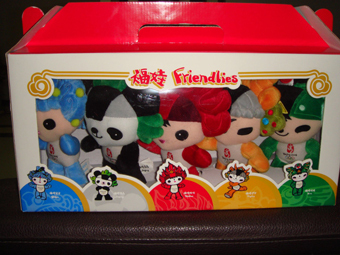 "The five Fuwas, the mascots of the 2008 Beijing Olympic Games, were wrongly sequenced and they had no label or authentication certificate. The colors of the counterfeited commodities did not match those of the authentic products," said a department statement. Police also found some coins with the Beijing 2008 Olympic Games logo which were not manufactured by the China Banknote Printing and Minting Corporation, the sole manufacturer entrusted by the BOCOG to produce commemorative coins of the Beijing Olympic Games. "The coins were produced without the permit of the BOCOG and manufactured in a rough way," said the department. A spokesman from the Beijing Municipal Public Security Bureau Haidian District Branch said that a local businessman surnamed Li told police on July 25 this year that he bought 57,000 yuan (more than 7,200 U.S. dollars) of Olympic Games commodities including commemorative coins and badges from Fu. Based on Li's report, police investigated Fu's stall and found that Fu was selling more than 20 kinds of commemorative coins along with mascots from previous Olympic Games. The price of the products ranged from 200 yuan to 1,000 yuan, only 10 percent of the authentic ones. Fu is the first person to be arrested for selling fake 2008 Olympic Games commodities in Beijing.